The Greatest Used Book in History Continued: August 1988 | You Monsters Are People. You asked and asked for it, so here it is. 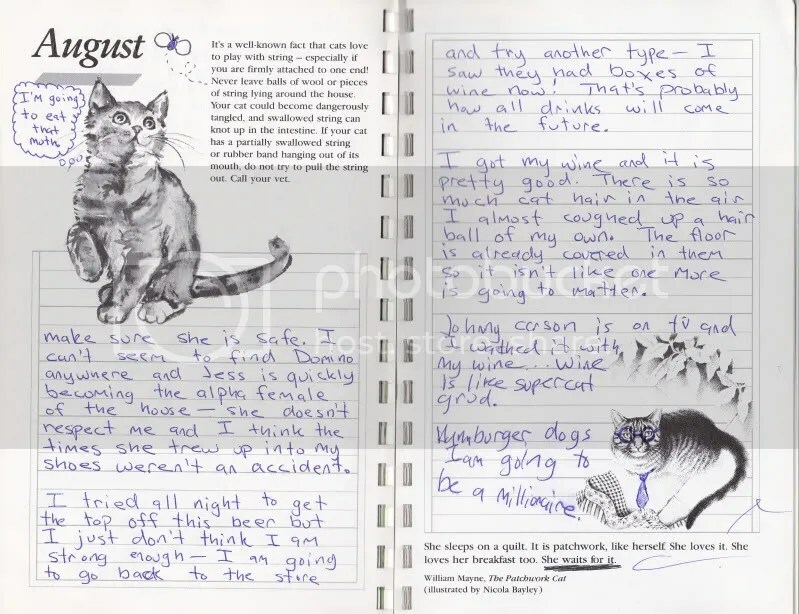 Despite all of my better judgement, I’ve finally scanned in the next month of this poor disturbed woman’s journal. 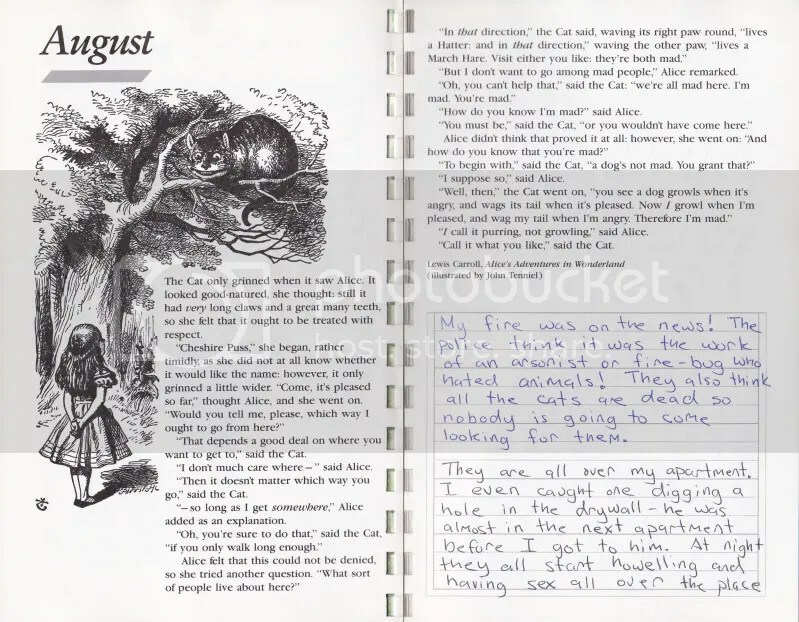 This is the eighth installment of the infamous diary within a used book that I procured from a clearance event for “junk books” in a rundown and partly abandoned library. 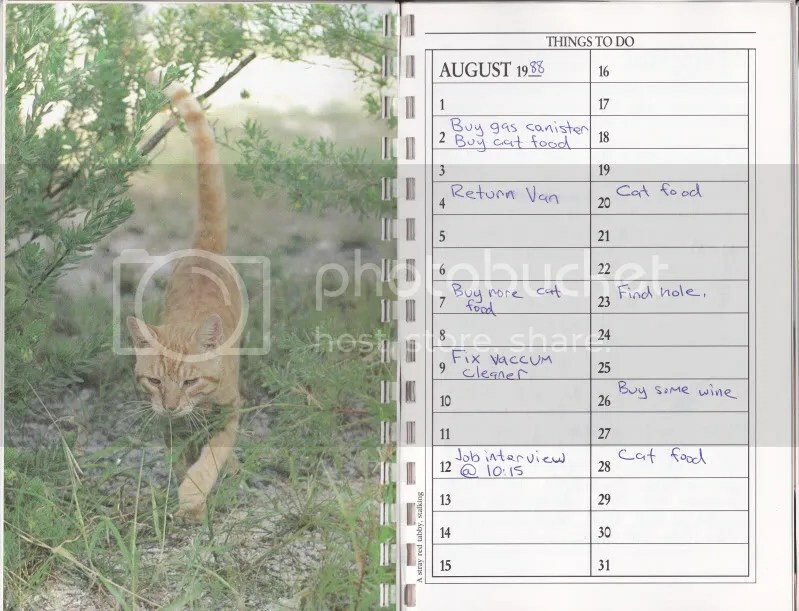 For those of you new to this odyssey, the journal is the story of a peculiarly amazing woman living in 1988 who just happens to love cats a little too much. 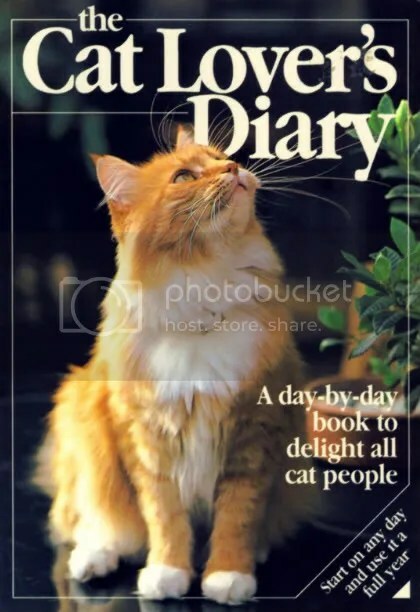 If you would like to enjoy her tale from the very beginning or catch up on some of her earlier entries, go to The Cat Lover’s Diary. 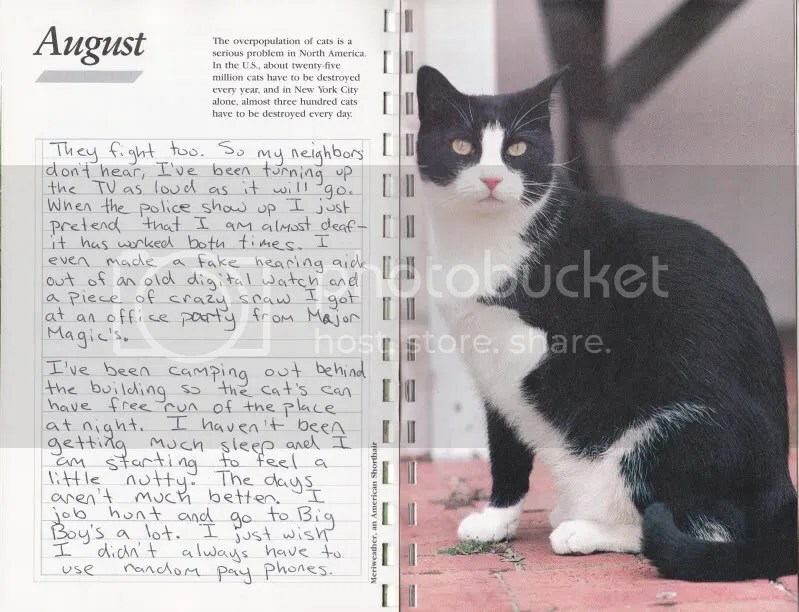 This entry was posted in books, cats, Dark Humor, humor, Life, pets and tagged cat fights, cat lady, cat lover's diary, drinking, greatest used book, houses that smell like urine, wine. Bookmark the permalink. This is seriously the greatest thing I’ve ever been linked to on the internet, ever. I need more!! Cat breath is the worst. Who thought a mouth that tiny could hold so much stink? 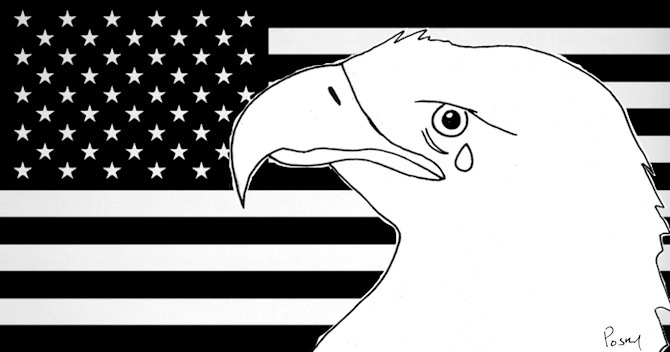 This is quickly becoming very depressing. Yet I still love it. What does that say about me? It says you are a monster. Also I like your book reviews. This is hilarious and also very sad. I worry about the future of this race but I am also very excited to read more. Comedy and tragedy are really all there is if you want to get all classical on the subject. Hopefully you’ll not be disappointed. She must be best friends with the guy down the street that has 200 black cats. Literally. So brutal I can smell the cat pea from here. I think it works just fine out of context. Don’t you? I just found this. I’m now an addict! I need more, as quickly as possible please. I was hoping it was a published book. I want to buy 50 copies and gift them this year. The book is out of print, however- the one with the entries that I post here is one of a kind. OK now I begin to wonder. Is this lady a weirdo or a spaz? I know she says no, but hey, burning down the animal shelter? There is just enough truth (Johnny Carson is on TV) mixed with fiction (Wine is like supercat grod) in this tale to keep me FASCINATED. If this person was in her midtwenties in 1988, she’d be closing in on 50 now. WHERE IS SHE? If that is a real show, I have no idea why I haven’t already watched every episode. yes, it is a real show on TLC. they made a seeries of (just) “hoarders”, and then they realized that people want more, so they found “animal hoarders”. (it is aired Sundays evening but here, GMT+1). can’t wait to see next season, wonder what new disfunctionality they find for us. If you haven’t already done so, you need to sell the movie rights to this story. The screenplay just writes itself. I see an Oscar in your future. No way. No way. No way!!!!!! This is one of the saddest, funniest, most disturbing things I’ve read in a long time. What the hell turns someone into a crazy cat person? Are they born that way, with some genetic defect, or is it some kind of unresolved Mommy issue? I am highly allergic to cats, so unless I wanted to make the ER my second home, I will never have this problem. Thank God. 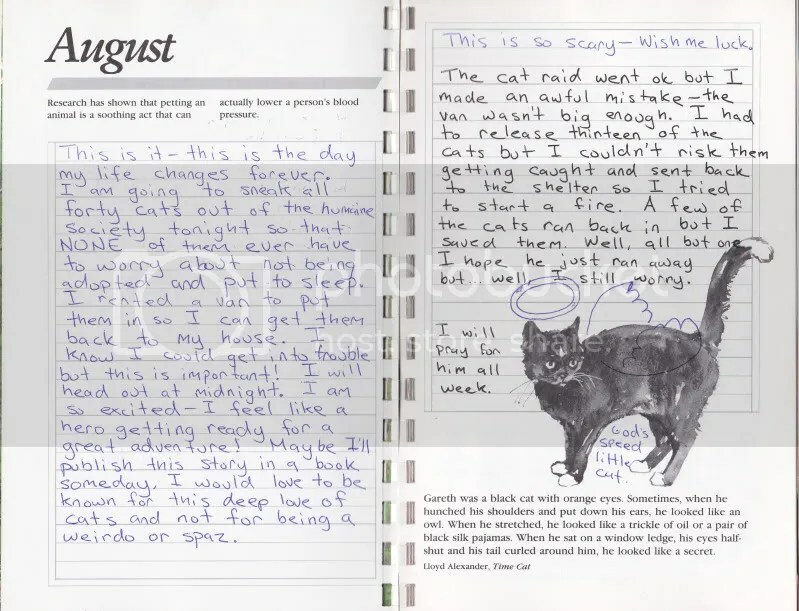 this is exactly what it is (if it is really really real diary, not somebody that brilliantly wrote a disturbing thing, you know, just to disturb). I wonder what Ailurophilia would mean? Hmm. OMG I just broke my chair laughing so hard. This is most excellent! I’ve waited for a whole month. Give us more! PLEASE! She doesn’t want to be known as a weirdo or a spaz…. I love the last entry, it gets really shaky and obviously alcohol laden. So now she will be a homeless crazy cat lady since she is already camping in the back yard. This cannot be real! Posky, this woman is either fake or the most intelligent/insane person around. I am agog.